An airline employee stole an otherwise empty passenger plane from Seattle-Tacoma International Airport on Friday night and performed dangerous maneuvers in the sky before crashing on a nearby island about an hour later, officials said. The employee, who was a ground services worker for Horizon Air, died. He was identified by a senior federal aviation source as Richard Russell, whom authorities described as a 29-year-old resident of Pierce County in Washington state. The Horizon Air turboprop plane took off from the runway at 7:32 p.m. local time Friday, with the man identified as Russell behind the controls and no one else on board, officials said. The 76-seat airliner was captured on video doing giant loops in the air and other risky stunts during its hour-long flight. North American Aerospace Defense Command quickly launched two F-15 fighter jets to pursue the rogue aircraft, a federal senior aviation source told ABC News. Meanwhile, the Federal Aviation Administration said it implemented a "groundstop" for Seattle-Tacoma International Airport as air traffic controllers "communicated with the individual who was flying the aircraft to try to help him land safely." 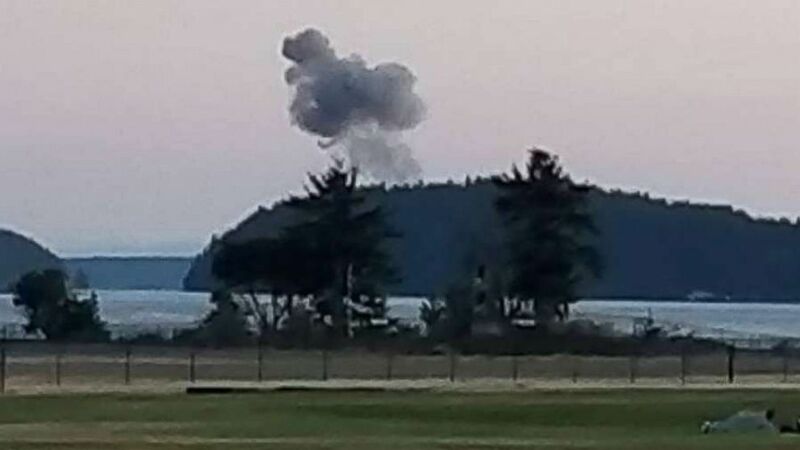 An hour after the unauthorized takeoff, the plane crashed on Ketron Island, a small, sparsely populated island about 40 miles away from the airport. The fighters jets were not involved in the crash, officials said. Aerial footage of Ketron Island showed a large fiery blaze where the plane crashed. No one on the ground was harmed and no buildings were damaged, officials said. Seattle-Tacoma International Airport flights were delayed or diverted Friday night due to the incident, with normal operations resuming by around 1 a.m., officials said. "This might have been a joyride gone terribly wrong," said Pierce County Sheriff Paul Pastor. Airline officials are unsure how Russell learned to operate a plane, much less perform flying stunts. There are many switches and levers to even start a plane, Horizon Air CEO Gary Beck told reporters at a news conference Saturday. "We don't know how he learned to do that." Beck said, adding that the man did perform some "incredible" maneuvers. "To our knowledge he did not have a pilot's license." The man was authorized to be in the area of the airfield where the plane was parked for maintenance, officials said. Beck said he and Brad Tilden, the CEO of Alaska Airlines, the parent company of Horizon Air, are working closely with the FBI, the National Transportation Safety Board and the Federal Aviation Administration to better understand the circumstances of the unauthorized flight. The FBI said it is leading an investigation into the incident, including interviewing the Russell's family and coworkers. Debra Eckrote, the Western Pacific regional chief for the National Transportation Safety Board, said investigators are searching through the plane wreckage to retrieve the flight data recorder, which could help determine a motive. Audio recordings of the Russell's exchange with air traffic controllers were posted on Broadcastify and confirmed by federal aviation sources as authentic. In the recordings, air traffic controllers can be heard trying to persuade him to land the plane and help him do so safely. They also had experienced pilots radio in to guide him on flying. "I just kind of want to do a couple maneuvers to see what it can do before I put it down," Russell tells air traffic control. "This is probably like jail time for life, huh? I would hope it is for a guy like me," he says a few minutes later. "We're not going to worry or think about that, but could you start a left-hand turn please?" an air traffic controller responds. "I don't want to hurt no one," Russell says a few minutes later. Air traffic control tries to convince Russell to land at the Air Force's nearby McChord Field. "If you wanted to land, probably the best bet is that runway just ahead to your left, again that's the McChord Field. If you wanted to try, that might be the best way to set up and see if you can land there. Or just like the pilot suggests, another option would be over Puget Sound into the water," an air traffic controller says. "Dang, did you talk to McChord yet, because I don't think I'd be happy with you telling me I could land like that, because I could mess some stuff up," Russell replies. "I already talked to them and, just like me, what we want to see is you not get hurt or anybody else get hurt. So like I said, if you want to try to land, that's probably the best place to go," the air traffic controller says. Minutes later, Russell sounds remorseful and says he's a "broken guy" with "a few screws loose." "I got a lot of people that care about me and it's going to disappoint them that -- to hear that I did this. I would like to apologize to each and every one of them. Just a broken guy, got a few screws loose I guess. Never really knew it until now," he says. A pilot who was asked to help guide Russell radios to him, "Let's try to land that plane safely and not hurt anyone." Russell responds, "All right. Damn it. I don't know, man, I don't know, I don't want to. I was kind of hoping that was going to be it, you know?" The Pierce County Sheriff's Department described Russell as a "suicidal male" who "acted alone," but that his actions were "not a terrorist incident." The FBI's field office in Seattle posted a statement on Twitter Friday night, also saying that the incident did not appear to be terrorism. "Although response efforts to tonight's aircraft incident and the investigation are still ongoing, information gathered thus far does NOT suggest a terrorist threat or additional, pending criminal activity," FBI Seattle tweeted. "The FBI continues to work with our state, local, and federal partners to gather a complete picture of what transpired with tonight's unauthorized Horizon aircraft takeoff and crash." White House press secretary Sarah Huckabee Sanders praised the response of public agencies in a statement Saturday morning. "The president has been briefed on the incident involving a stolen plane from Sea-Tac Airport in Seattle and is monitoring the situation as information becomes available," Sanders said. "Federal authorities are assisting with the ongoing investigation which is being led by local authorities. We commend the interagency response effort for their swift action and protection of public safety." ABC News' Alex Stone contributed to this report.